Emirates has launched the Emirates Vintage Collection – a selection of fine wines from its cellar in Burgundy which have been stored for up to 15 years. 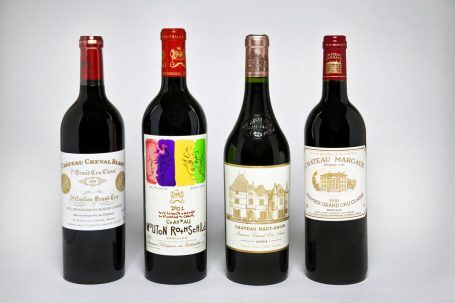 The four wines to be included this year are the Château Cheval Blanc 2004, Château Haut Brion 2004, Château Mouton Rothschild 2001 and Château Margaux 1998. Due to limited availability, these exclusive wines will be served in First Class on select routes for a limited period. The Emirates Vintage Collection was launched on board last week on a special flight to Paris with the Château Cheval Blanc 2004. Arnaud de Laforcade, Commercial Director of the Estate, gave customers a surprise wine masterclass at 40,000 feet in the iconic Emirates A380 Onboard Lounge. The special tasting gave customers the chance to savour the Château Cheval Blanc 2004 and 2006. The four wines will be staggered throughout the year on various routes in Europe, the Americas, Asia and Australasia. The selection is a testament to Emirates’ continued investment in Bordeaux wines – a staple on its wines lists. Last year alone, the airline purchased USD 56 million worth of wines and champagne in France. Since 2006, the airline has invested USD 780 million in wine from around the world to give its customers an unmatched culinary experience on board. Today, the airline has a world class offering of over 80 fine wines and champagnes served across its network daily. Over the next few years, more wines will be added to the Emirates Vintage Collection once they have reached optimal maturity. The Emirates cellar currently holds 4.7 million bottles of wine – some of which will only be served in 2027. Cheval Blanc is the leading estate in Saint-Émilion and the most famous Cabernet Franc-based wine in the world. Some vintages from this unique terroir are legendary, such as the 1947 which Robert Parker describes as ‘the crown jewel in any millionaire collector’s cellar’. The 2004 has a perfumed nose of cherry, raspberry and rose petals. Medium to full-bodied, the palate shows candied strawberry and redcurrant laced with exotic spice. Firm tannins and succulent acidity provide perfect balance. This spectacular château is often called the Versailles of the Médoc’. Andre Mentzelopoulos’ daughter Corrine took over a vastly enhanced estate from her father in 1980 and following her father’s lead, makes improvements with every vintage. This 1998 has fresh plums, black cherries and spicy blackberries on the nose, with a hint of black tea and smoke. The palate is medium to full-bodied and peppery upon entry, develops with leathery notes, damson plum and the balance, grace and charm that epitomise the wines of this appellation. The oldest of the classed growths, and the only first growth outside the Médoc, Haut-Brion boasts an illustrious history with references from Pepys, Jefferson and a mention in the 1660 cellar ledger of English King Charles II. Its current regal credentials are just as impressive, with the management of the property now overseen by Prince Robert of Luxembourg. The 2004 displays typical Graves aromas of blackcurrant and cigar-box with hints of black olive. The palate is medium-bodied and harmonious, with graphite-tinged black fruit caressed by tender, fine-grained tannins. The 1855 classification of Bordeaux’s wines from first to fifth growth status was based on recent market prices for a vineyard’s wines, with one exception: Château Mouton Rothschild. Despite Mouton’s market price equalling that of Château Lafite Rothschild, it was excluded from the 1er Cru tier, an act that Baron Philippe de Rothschild referred to as “the monstrous injustice”. After decades of intense lobbying by the Baron, in 1973 Mouton was finally elevated to “first growth” status and justifiably so, as it surely ranks as one of the best wines, not just of Bordeaux, but in the world! The 2001 has a complex and open bouquet with notes of blackberry, forest floor, graphite and hints of orange peel. The palate is medium to full-bodied with fine tannins, superb acidity, great depth and a distinct mineral note to the tobacco toned finish.